The Raven's Tale. (Haida story) Long ago no divisions existed between humans, animals and spirits. All things of the earth, sky, and, water were connected, and all beings could pass freely between them. The Raven was a trickster full of supernatural power. He stole the sun from his grandfather, Nasshahkeeyalhl, and made the moon and stars from it. The Raven created lakes, rivers and filled the lands with trees. He divided night and day, then pulled the tides into a rhythm. He filled the streams with fresh water, scattered the eggs of salmon and trout, and placed animals in the forests. The first human was hiding in a giant clamshell, and Raven released them onto the beaches and gave humans fire. Raven disappeared and took with him the power of the spirit world to communicate and connect with humans. Quite a bird is the Raven, and one of the most intelligent and fascinating of all bird species. It is extremely powerful and central in the mythology of many of the Indigenous peoples of the Americas. The Common Raven (Corvus corax) displays abilities in problem-solving (often without the intermediary steps of trial and error), as well as other cognitive processes, such as imitation and insight. Ravens have also been observed coercing other animals to work for them. For example, they will call wolves and coyotes to the site of a dead animal where the canines will do the job of opening the carcass, making it more accessible to the birds. Another aspect of Raven behavior that has been observed is their tendency to enjoy playing – especially the juveniles. They have been seen (and filmed) sliding and rolling down snow banks for the sheer joy of it. Not just large but massive (they are considerably larger than crows), Ravens have thick necks, shaggy throat feathers, and a Bowie knife of a beak. Common Ravens are entirely black, right down to the legs, eyes, and beak. They are 22-27 inches in length with a wingspan of 45 to 51 inches and weights recorded up to 3.6 lbs. Common Ravens live in open and forest habitats across western and northern North America. They do well around people, particularly in rural settlements but also in some towns and cities. As many as 33 different Raven vocalizations have been recorded. The most commonly heard is the classic gurgling croak, rising in pitch and seeming to come from the back of the throat. Among their other calls, Ravens make short, repeated, shrill calls when chasing predators or trespassers, and deep, rasping calls when their nests are disturbed. Dominant females sometimes make a rapid series of 12 or so loud knocking sounds that last about a second. 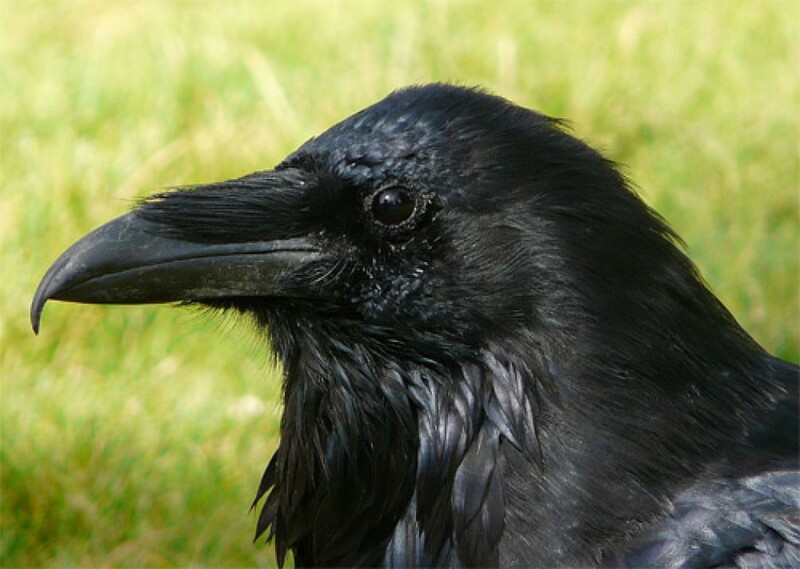 Common Ravens can mimic other birds. When raised in captivity, Ravens can even be taught words. The Common Raven is an acrobatic flier, often doing rolls and somersaults in the air. One bird was seen flying upside down for more than a half-mile. Young birds are fond of playing games with sticks, repeatedly dropping them, and then diving to catch them in midair. Common Ravens will eat almost anything they can get hold of. They eat carrion; small animals from the size of mice and baby tortoises up to adult Rock Pigeons and nestling Great Blue Herons, eggs (and the chickens that lay them), grasshoppers, beetles, fish, grains, buds, and berries; pet food, and many types of human food including unattended picnic items and garbage. Breeding pairs must have a territory of their own before they begin nest building and reproduction, and thus aggressively defend a territory and its food resources. The nest is a deep bowl made of large sticks and twigs, bound with an inner layer of roots, mud, and bark and lined with a softer material, such as deer fur. The nest is usually placed in a large tree or on a cliff ledge, or less frequently in old buildings or utility poles. Females lay between three to seven pale bluish-green, brown-blotched eggs. Incubation is about 18 to 21 days, by the female only. The young fledge at 35 to 42 days, and are fed by both parents. They stay with their parents for another six months after fledging. The adults, with no known natural predators, are often successful in defending their young from predators (such as hawks and eagles), due to their numbers, large size and cunning. They have been observed dropping stones on potential predators that venture close to their nests. All in all a fascinating bird. Wouldn’t it be wonderful if the Trickster brought back the power of the spirit world to communicate and connect with humans?